BMW X1 much applauded Efficient Dynamics technology plays a part in the BMW story with the introduction of Auto Start-Stop technology on an X product for the first time. Available on all manual transmission cars the system improves fuel consumption figures. 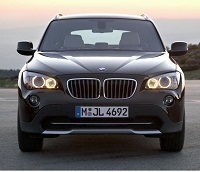 The new BMW X1, based on the current 1 Series platform, completes the X line-up of X3, X5 and X6 models. The 18d with 143bhp and 320Nm of torque and the 20d with 177bhp and 350Nm. The X1 range includes rear wheel drive and permanent four wheel drive models called sDrive and xDrive. Slotting in between the BMW 3 Series Touring and the BMW X3, some may be confused by the looks of the X1. It’s not really designed to tackle off-road obstacles in the same way as a Land Rover Freelander, but it does offer the raised seating position and image of an SUV. And, while it’s not as hunkered down as a saloon, big wheels do give it a sporting stance. The five door, five seat X1 certainly takes its styling theme from other X models in the BMW range but it is less obviously a bulky 4×4 or SAV to attract a car audience. It has a softer styling so as not to put potential owners off buying a 4×4 type vehicle. Inside is an environment that will be familiar to drivers of the 3-series. There are the same dials, a closely related dash and identical switchgear. Quite why no shots of the interior were allowed is a mystery, unless BMW was keen for you not to find out it contains absolutely nothing out of the ordinary. How does the X1 fair on the road? Very well. The BMW X1 is definitely up there with the class leaders, sharply turning in with very little body roll, and backed up by a helm that has no slop or slack. And at speed it’s quiet too, with only a faint rustle from the enormous door mirrors. The great thing about all BMW X models is just how well they drive on the roads under all conditions. There is none of the body roll, choppy hard and non compliant suspension characteristics. Road holding, grip and steering is almost as sharp as most of their passenger cars. The X1 drives like a really well sorted sports estate, despite it extra height and weight. Add the xDrive all wheel drive function and the vehicle was even better especially when it came to long sections of rough stone tracks and very wet gravel sections such as you might find on a rally. BMW has chosen to make the BMW X1 road-biased. For most potential customers this will make perfect sense – why compromise handling for the very rare off-roading they’re likely to do. All ‘Sdrive’ X1s are rear-wheel drive only, while ‘Xdrive’ versions get four-wheel drive. Want a BMW X1 and cant fint it? New, demo or used. Don't let one large car repair deplete your savings or max out your credit cards. Draw Realistic Cars in 3D Easily like a Pro, A 260 page Step by Step Guide!